I have created this website to help people become more familiar with what is available when wanting to enjoy the great outdoors. This site not only details many outdoor areas to enjoy, but it also helps you to become more comfortable with some of the tools and instruments currently available to help you feel more at ease while out and about. The main thing that has opened the world to me is the handheld GPS (not the car GPS), everyone should have one if they really want to get out and about. There are a few APPS on smartphones which take advantage of the phone's GPS chip, so you could use a smartphone if your really wanted to. One easy way to get use to using a GPS is by getting into the sport of “GEOCaching” (See GEOCaching - General Information). I am known in GEOCaching as "Frog Man" - if you want some tough caches, look me up! Use the "Quick Links" on the right side to look at list of webpages at any time or return to this page (Home Page). Note: In many of my documents I refer to GPS coordinates (coords). I highly recommend that if you are not a Google Earth user that you read these two entries on this website about Google Earth. Below is listing of all the pages which make up this website. To go to a page, just click on the name (or right-click to allow using tabs) and you will be linked to the detail data page. • FWC Hunting Activity Calendar - Look Before You Hike! Some of the areas I visited, just some information and tracks. 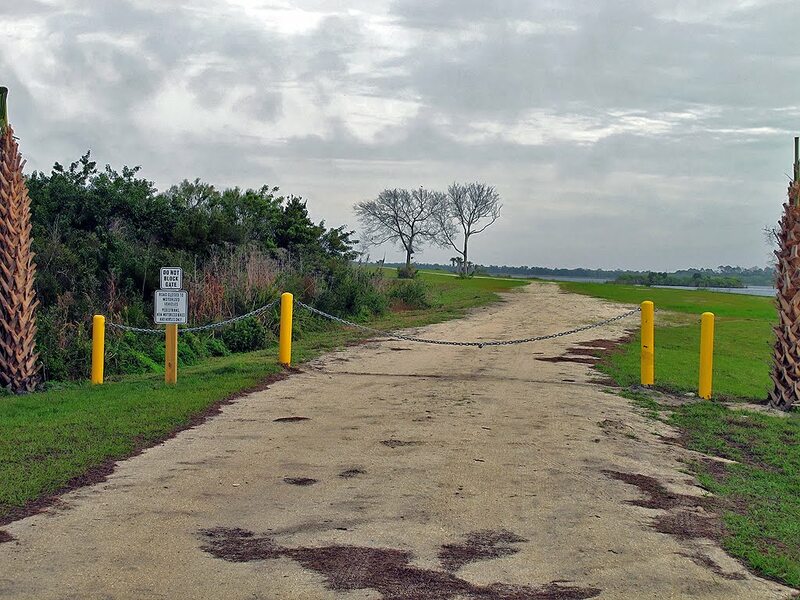 EEL property – mostly open, but with some blazed trails. It was a pleasant place to visit. This vast sanctuary is made up of a number of different sections. Each section has a set of blazed trails. You will encounter a variety of ecosystems as you meander through the area. The one drawback is that the trails are shared with trial bikers. I found the idea of being run over as a walked along a very bad feeling! This small EEL sanctuary is a pleasant place to stop for a short hike. I went looking for birds and GEOCaches, I did find both. The day I visited the area I had the place to myself. I looked for the plant the sanctuary is named for, Dicerandra, but didn’t see any. 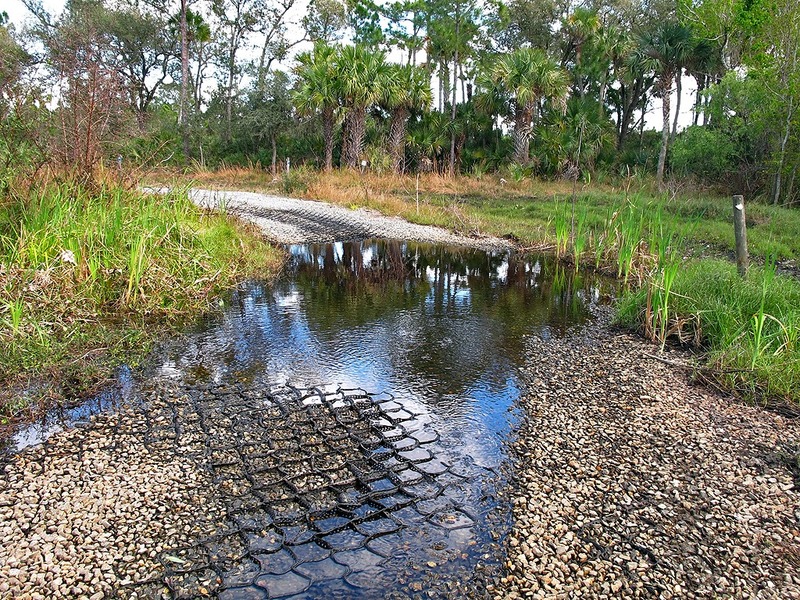 This small EEL Sanctuary is pretty much out in the open, a true “scrub”. There is a small blazed loop trail you can follow. Being that it is open and sandy, it really could be a tough place in the warmer hotter months. I went looking for birds and GEOCaches, I did find both. The day I visited the area I had the place to myself. This is a pretty vast park. 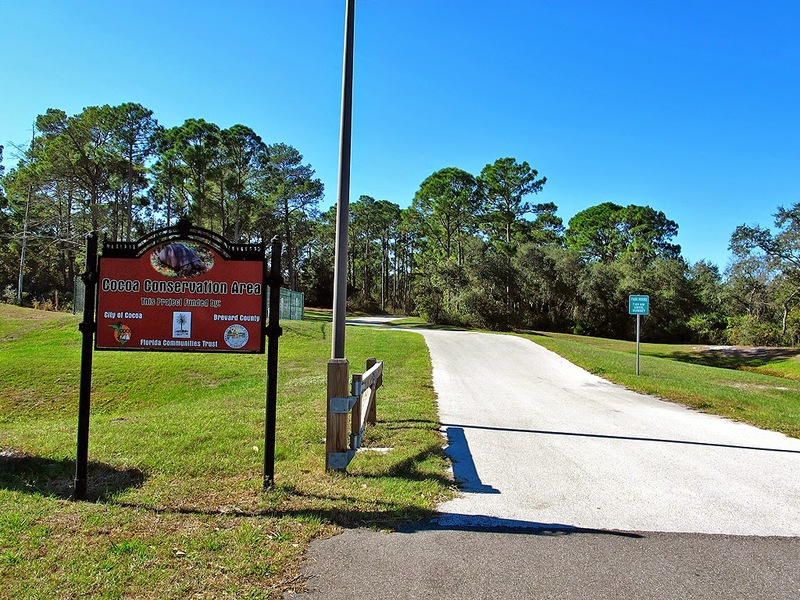 It was once known as the “Rockledge Community Park”, it has since been renamed. It is a true “community” park, with things for everyone to do. I visited the park to explore and wander the vast trails which crisscross the park. I’m not sure of the actual boundaries, so I really ventured around! It also has a variety of GEOCaches to be found if you so wish. A good deal of it is open, so be aware of that. 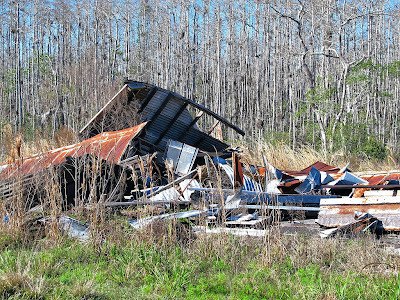 This is EEL's "home" in northern Brevard county. It has a reception center and a museum. The trails are well laid out and marked well. You also will encounter what is left of the Addison Canal. Many sections are open, so watch the heat! It also has a variety of GEOCaches to be found if you so wish. It is also closed completely on certain days, so check their schedule. This is an actual Island along the St Johns River. In order to get to the island you must wait for the ranger's pontoon boat to come and get you. They do not run a schedule, so just wait! This is another area with a variety of ecosytems. 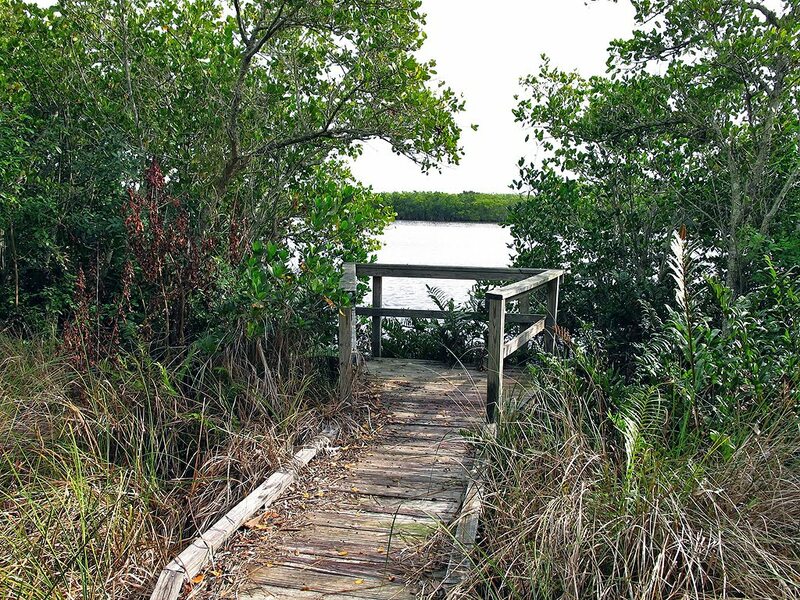 You will encounter swamps and open scrub during a hike around the island. 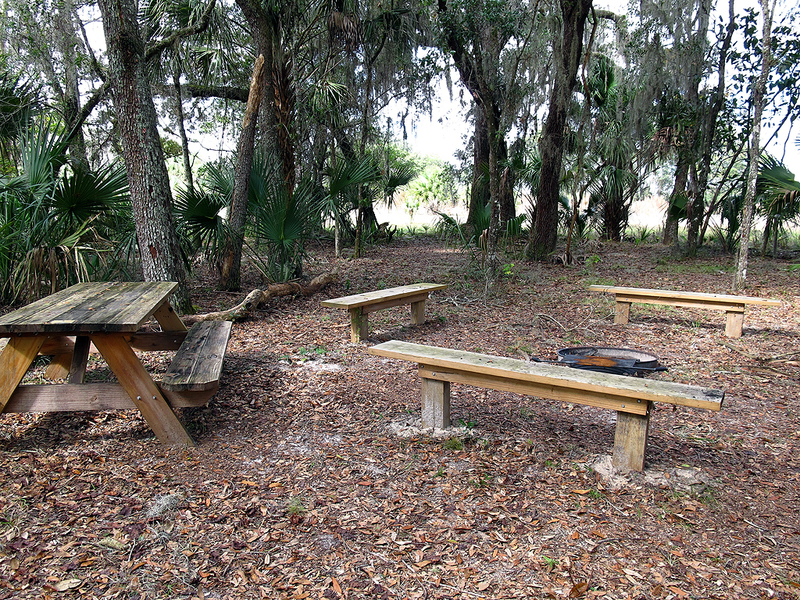 There is a camping area located on the island, both for primitive camping and cabin rentals. 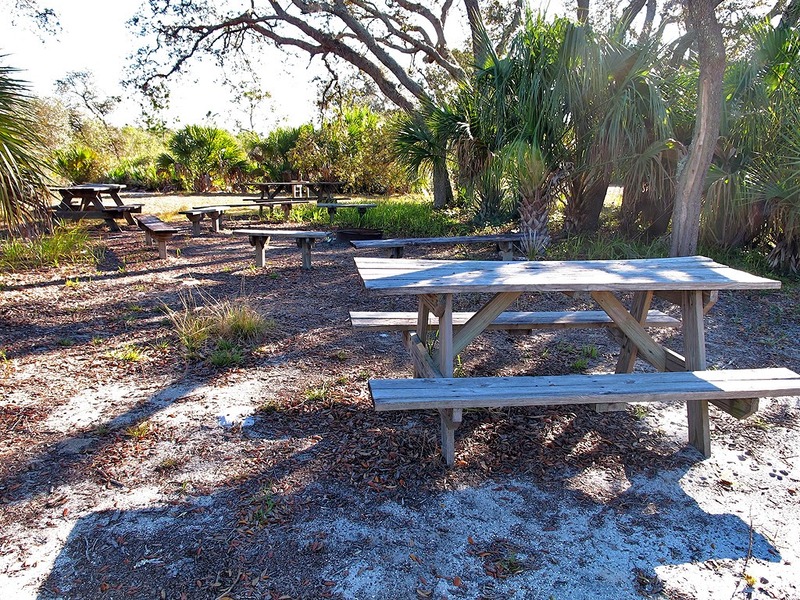 There is an abundant area set aside for picnics, so bring your lunch! Many sections are open, so watch the heat! The trails are not always marked, so a GPS is nice to have. It also has a variety of GEOCaches to be found if you so wish. The rangers are wonderful, so make sure you stop and say hello at the small store there. The Triple-N’s vastness is so huge it is doubtful you could see the whole ranch from anyone of the access points. I am told that during hunting season, the roads are open to vehicles; I suspect that it is just to hunters. Be forewarned, this is mainly a WMA, that means hunting interests are the prime concern, while all other interests [hikers, bikers, birders and equestrians], are secondary.. I suggest that you don’t enter the ranch during hunting season unless you are hunter. I also suggest that you have access to a GPS (handheld or phone) and mark your access point. 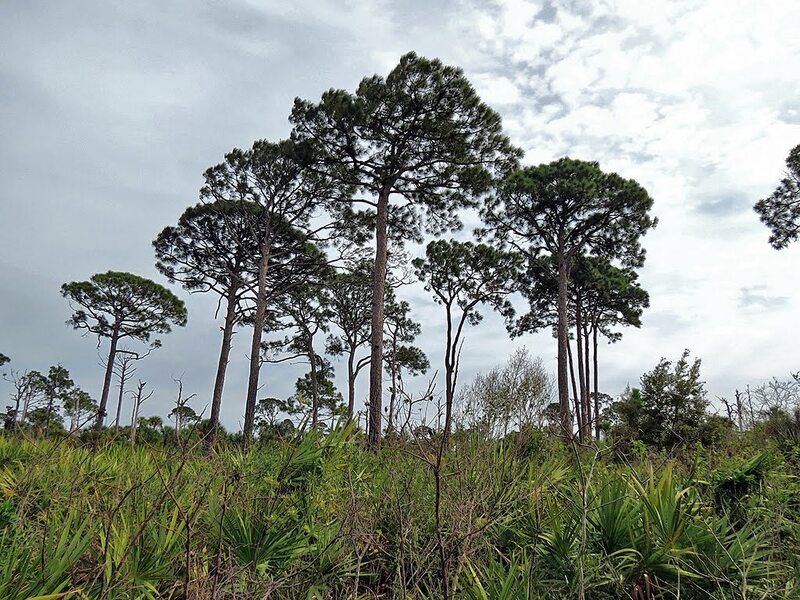 Much of the area is just palmettos and pines and looks the same. The GPS coordinates of the two access points I used are listed below. Choosing to enter near the Crabgrass Creek Bridge is nice because it is takes you in just below Crabgrass Creek. You must park at an area on the left side of the road. The parking area is also used as an entrance to Bull Creek WMA. 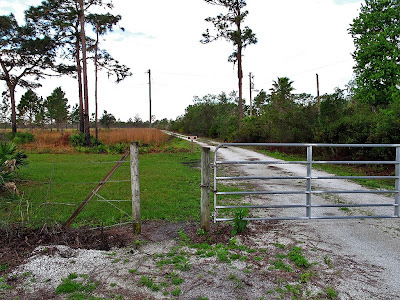 After parking, walk down Crabgrass Road to the entrance to Triple N Ranch, there is a dirt road with a gate. There is no signage, so just be sure to find the right spot. You may have to climb over the gate. 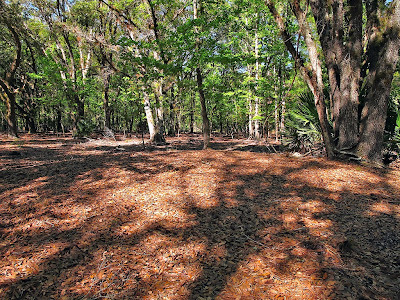 Many Florida homesteaders lived around creeks, for the water and the shade provided by the taller trees found around water. The State of Florida has decided to destroy anything historical in these areas for some reason. It disturbs me when I find what I know is an old homestead area, but everything relating to it has been bulldozed under. I am disgusted with whoever decided that was a good thing to do! Once it is gone, it is gone! The reason I mention it at all is that while wandering around this section of the ranch I found many remnants of old time Florida. Old fences, foundations, vehicles, cattle vats and other miscellaneous items missed by the bulldozer (maybe too far into the swamp). It may be gone by now, but I did see it. You can see old orange trees which were planted by very strong willed people quite a while ago. 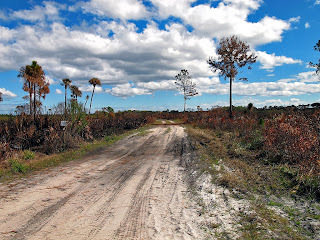 Outside the cypress swamp you will encounter dirt roads, palmettos and pines. There are a few cypress domes scattered throughout the area. 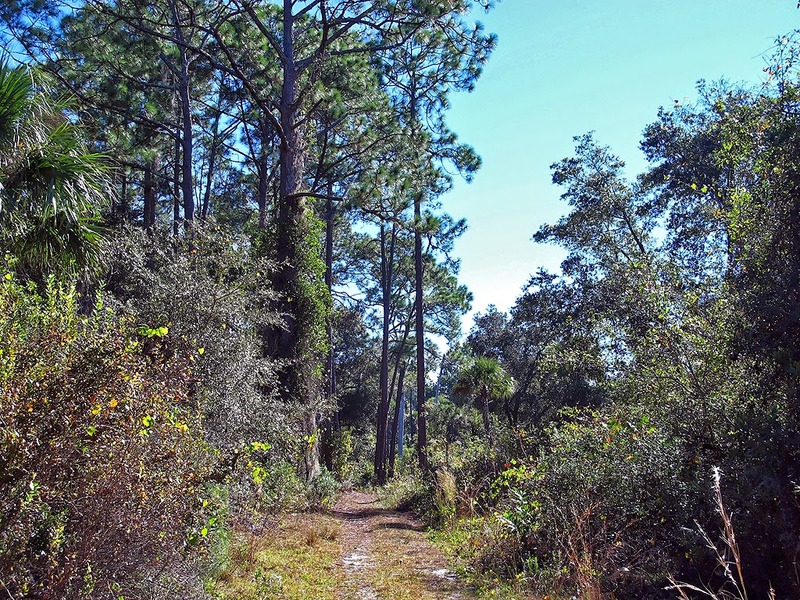 The lower access point will lead you into an open area of palmettos, pines and some cypress domes. The parking area is at the end of Crabgrass Road. You will see a dirt road across from the entrance to Bull Creek WMA. Take that road and the first left. There should be some signage, but if not don’t worry. The parking area is vast. It is a very pretty area to start your exploring; there is a nice pond there. I believe this area was also part of a homestead once upon a time. Enter Road #9 through the gate and start your wandering. You really can’t wander off the roads very much; previous cattle trails have all grown over. The area was part of a number of ranches and they had cattle. Normally you can find some nice trails when cattle are present, but due to the prescribed burns performed over the years, all the old trails seem to be gone. The day I visited the area I hiked down to what was an old ranch. I had seen photos of it when visiting Boonie Man’s website. I had contacted him and he told me it was a nice place to visit. I hiked over 4 miles to it; only to find that it had been pretty much destroyed by the state (seems another casualty of their bulldozer). Needless to say I was disappointed finding nothing but a pile of rubble! Even though the buildings are pretty much gone, you still can get a feel of the times. 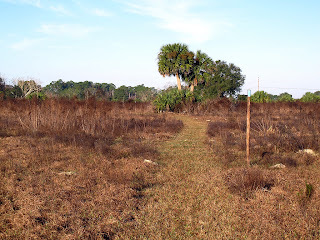 There still where some fenced in areas, private ponds and even palm trees around the area planted by the homesteaders. This southern section of the ranch is a pretty place to visit. The blue sky and clouds over the area were just spectacular! Many of the pine trees seem to have a personality all their own! There are some cypress domes and swamps around. I did hit some water around the cypress swamps, so if you go during the wet season, expect that and be prepared. Just about in the middle of the southern section the FWC is creating a shooting complex, as of early 2014 it had not been completed yet. It is proposed to be quite the place, so if you hear a lot of gunfire in the future it may well be the shooting complex. The Triple N Ranch is vast; it is unlikely that you will see every section of it on foot. You can bike it, but I would hate to get a flat tire way out there in the scrub. I only walked as far as I could walk back. Make sure you have water, sunscreen, bug spray and a good hat! A GPS is also highly recommended. If you own a lightweight portable seat of some sort, it might be good to bring it along. Benches are not provided to weary explorers. Be aware of hunting, you can use the Internet to get the hunting times or you can go to the main entrance on RT192. If hunting is going on there might be a FWC representative there. The roads are nice, with all the main ones numbered. The walking is flat and easy going, since you are walking on old roads. Certainly, easy on the ankles, as you don’t need to be concerned with tripping on cypress knees, roots, vines or long grasses. Plenty of time to enjoy the blue skies and the tall pines dotting the horizon line in front of you. I did come across a certain amount of wildlife – sandhill cranes, turkeys, hawks, songbirds, wading birds and some deer. During my last visit in early 2014 I found very few wildflowers, this seems to be a real problem. These areas use to produce all kinds of wildflowers; I hope that when you wander around that the wildflowers have returned! 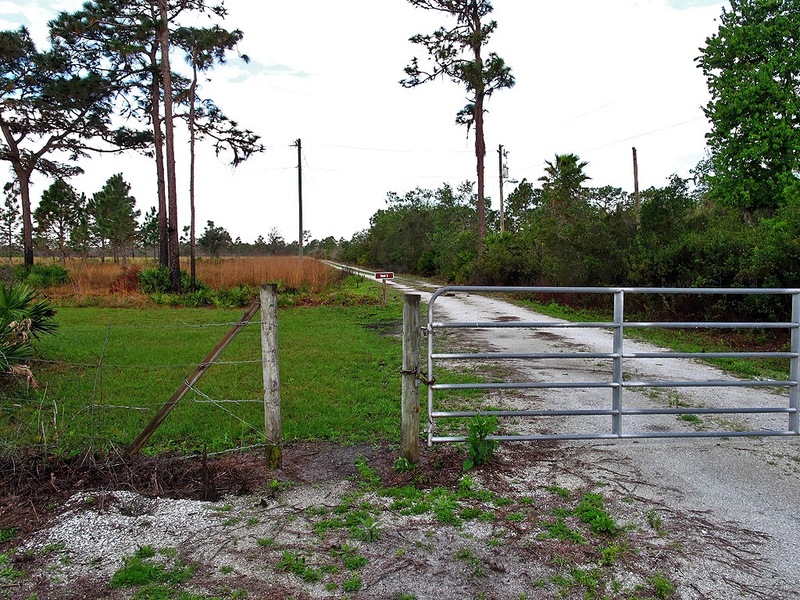 This 166 acre conservation area is located just below RT524. There is no access from RT524, you have to enter at the end of Cocoa Bay Road. This is reached by entering the Cocoa Bay Development. Please, mind the speed limit and respect the residents of the development. 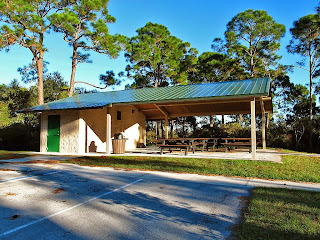 Drive up and around to the picnic pavilion. Here you will find plenty of parking provided around the entrance to the conservation area. 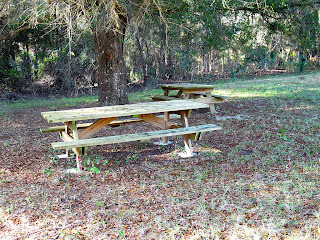 There also are ample picnic tables provided by the city in a well maintained pavilion. The conservation area itself is a very nice area with an old homesteader’s road running through it. I suspect that once upon a time it was used as the main road over to what is now RT524 and beyond. As you walk around the area you will see some remnants left from the original homesteaders. 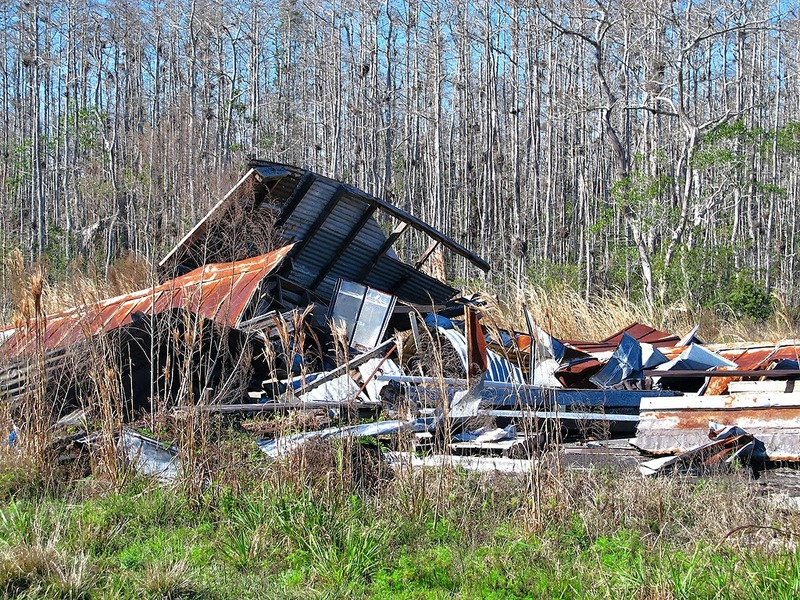 It has been my experience that the early 1900s history in Florida seems to have been destroyed. Certain remnants and discoveries from my wanderings (and GEOCaching) in the area are clues to a previous history now forgotten. I would always like to hear from anyone who knows the history of the area. There is a pond near the road where I did hear what I believe to be an alligator jumping into the water. I warn everyone to keep their pets away from this and any pond in Florida. Alligators like the taste of dog! There is a stone structure near the road which might have been what is left of a bridge or a dam. I tried working my way off the main roads and trails, but Mother Nature has done a good job of closing many sections off. Between the thorns, tight brush etc. ; it proved to be a formidable task. 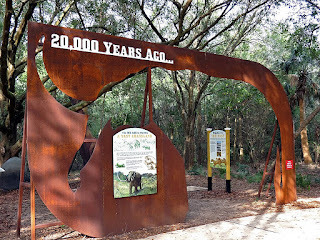 I only spent one day there, if you’re into looking for something historical you might want to spend some time really exploring this conservation area. As far as just going for a walk or GEOCaching, this is a very nice spot. I did see some of the locals doing their daily walking along the main road/trail. I have been asked if there was any unsavory activity going on in the area considering it is pretty close to many things. I did not see any signs of unsavory activity, so that is good. I always carry a good pepper spray dispenser just in case of anything – maybe even a rabid animal! As I stated earlier, there is a main road/trail leading over to RT524. 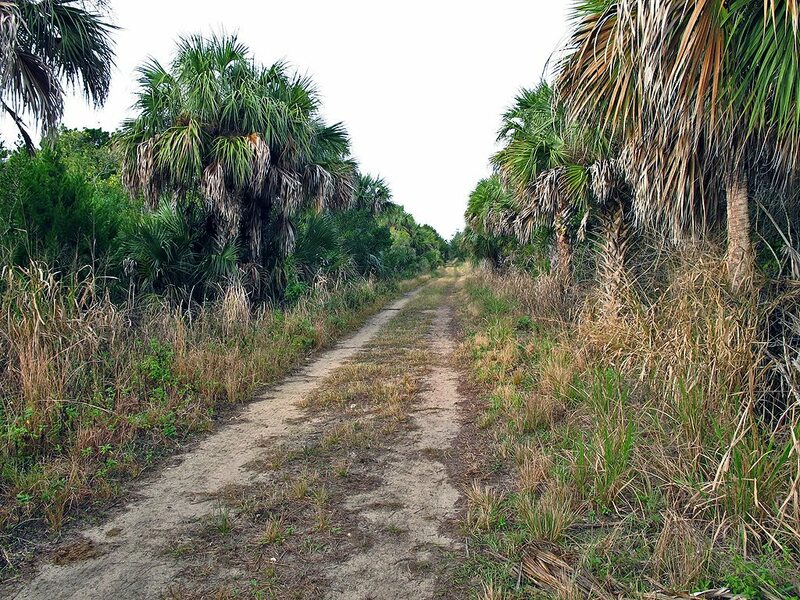 Along this road you will pass through a few ecosystems found in this section of Florida. There were palmettos, pines and oaks, as well as some wetlands. There is a large lake in the conservation area, but I never found an access to it (I did try). 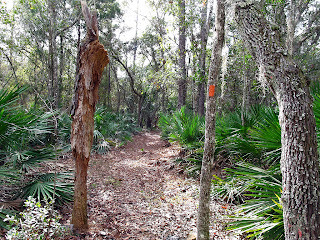 There are some old trails in the oak hammock section of the area which were nice to explore. The only wildlife I spotted was a rabbit (I did hear the gator). Wildflowers in Brevard during the winter of 2013-2014 were just about nonexistent, that proved true in this area also – no wildflowers! I would suggest that as you enter the area from the gate at the parking area, go down the hill and take the old road to the right and follow it out to RT524. You will pass through some interesting areas. This is not a loop, so head back to the original entrance. Now take the road to the left, you will pass through both oak tree and pine tree areas. If you follow this you will loop back to the original parking area. You can see my tracks from my visit below. This is a very nice area which the city of Cocoa (with others) has set aside for conservation. If your into GEOCaching (see my website entry about it), there are some great caches located throughout the area. The open roads and trails are very nice to hike around on. Getting off the main drag seems to be pretty difficult! If you’re into challenges, take the time to explore the places no man seems to have been in a long time! When you do visit the area and notice someone looking through the brushes it most likely is a GEOCacher trying to find a cache. When visiting, look around at some of the historical items left by the early homesteaders. 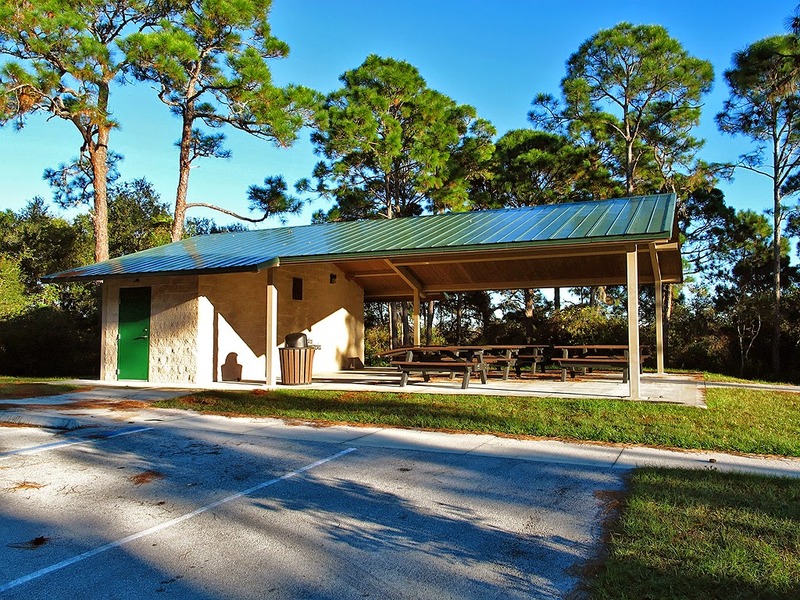 Bring a lunch and enjoy the picnic pavilion at the entrance. Much of it is open so it might not be the best place to be on a hot Florida day. Overall it is a very nice place in Cocoa to spend some time. 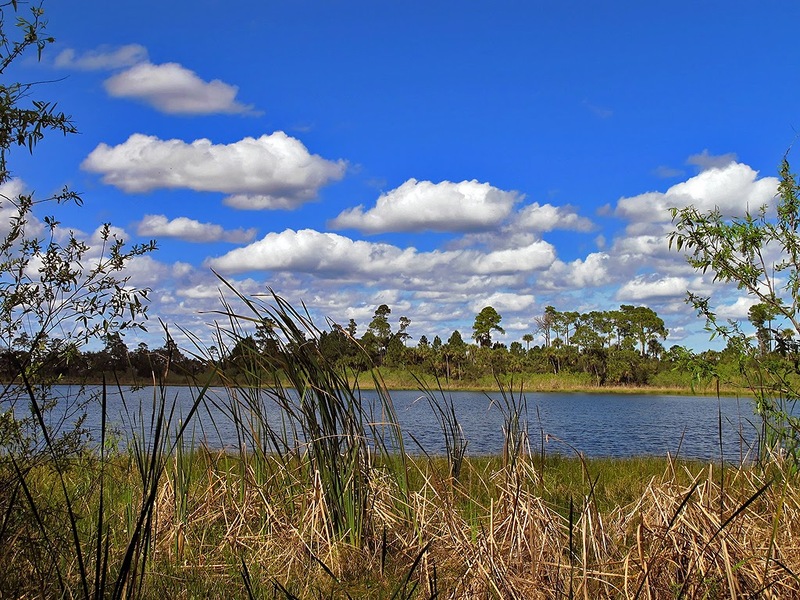 The Buck Lake Wildlife Management Area (WMA) is huge, reported to be 9,291 acres. The area is also referred to as “Buck Lake Conservation Area”. It is located above RT46 in Mims, Florida. It runs from I95 on the east to Morgan Alderman Road on the west. There are three entrances to the property; the main two are referred to as the East and West Trailheads. There is another entrance located off Morgan Alderman Road, that one is used mainly by hunters. I have entered from both the East and West Trailheads, each have their own attractions. Ample parking is provided at both trailheads. There is quite a bit of hunting done in the area during hunting season, it is not recommended that you enter the area during the hunting season! During my visits I did see some wildlife; deer, osprey, river otter, turkeys, songbirds and some other critters. 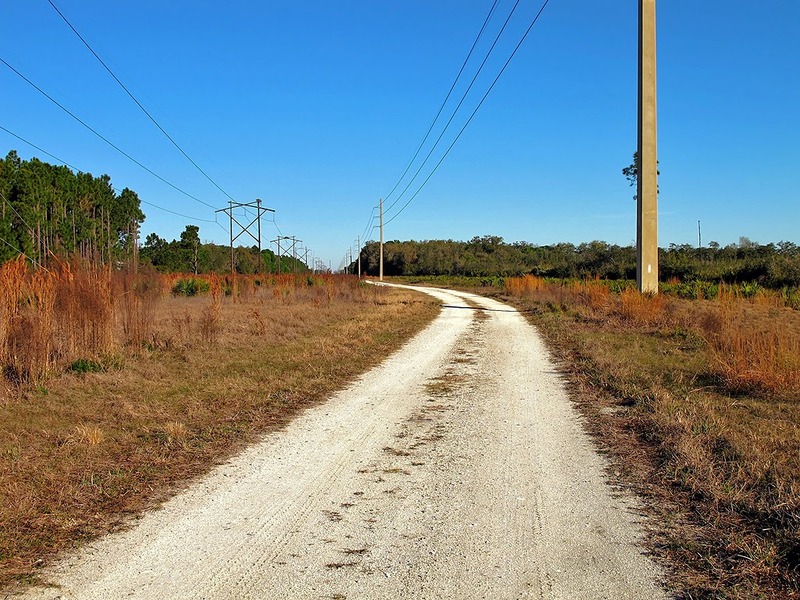 The whole area is crisscrossed with old dirt roads, which could be better to bike than hike! 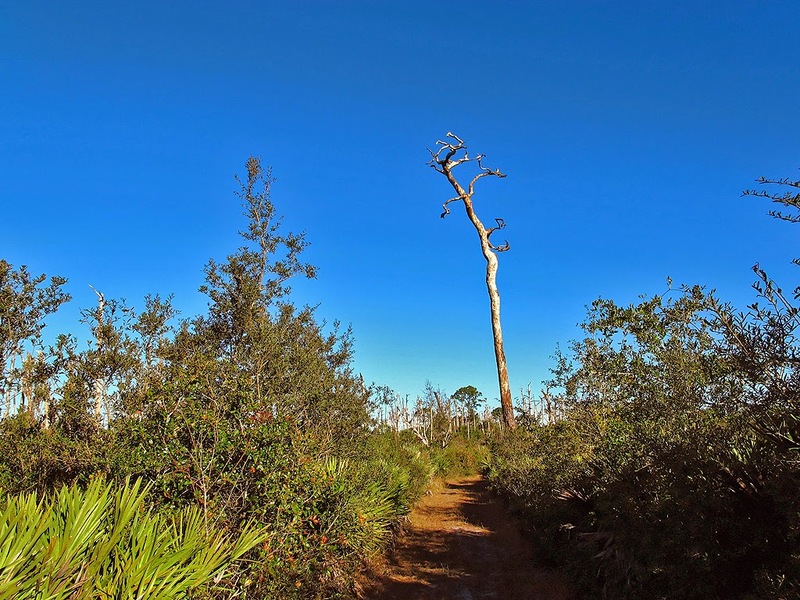 There are a couple of short blazed trails in the area, one leads to the Buck Lake observation tower and the other is just a short loop through the scrub. 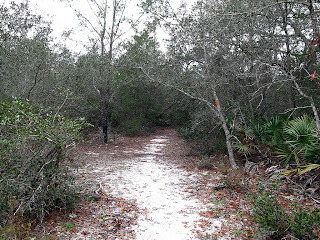 There is a long blazed white w/red trail which is actually just old dirt roads. I have documented two of my hikes on Wikiloc (see below), to help you better prepare for a day of hiking Buck Lake There are two primitive campsites located within the area, controlled by the SJRWMD, contact them for more information. I found one very nice area and a couple of just open areas. I have read that camping isn’t allowed during hunting season. . It has been reported that there are four cultural sites located within the boundaries of the WMA. I have no idea what they are or where they are, but if you find them, good for you! I did come across a few spots on the trail/road with water or rather wet areas. The wet areas were dry in February, but it looks like it could be a problem during the wet season. 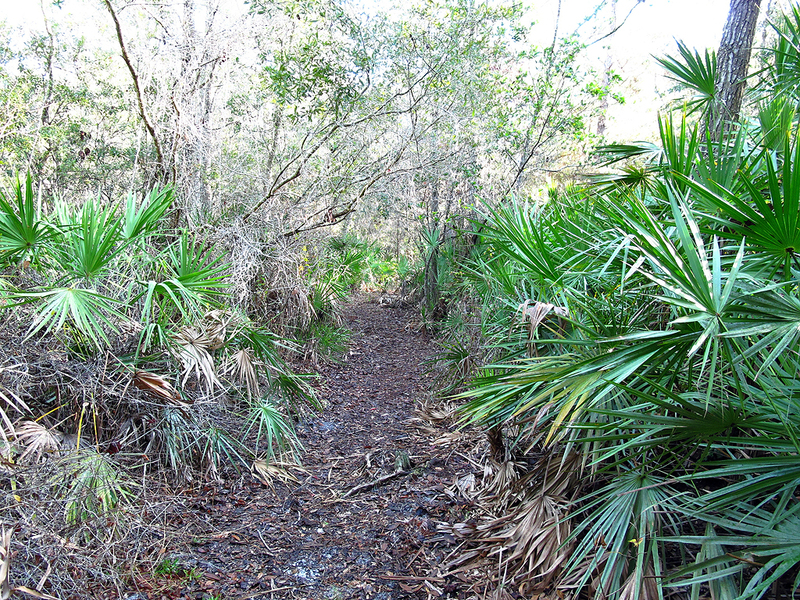 There is one short loop located near the East Trailhead which takes you through the scrub area of the WMA. It is blazed with yellow markers. I am assuming that is where you might encounter some monitored scrub jays. I have not done this loop, but I understand it is a nice trail. Like much of the rest of Buck Lake, it is pretty open with a few random areas to provide shade. 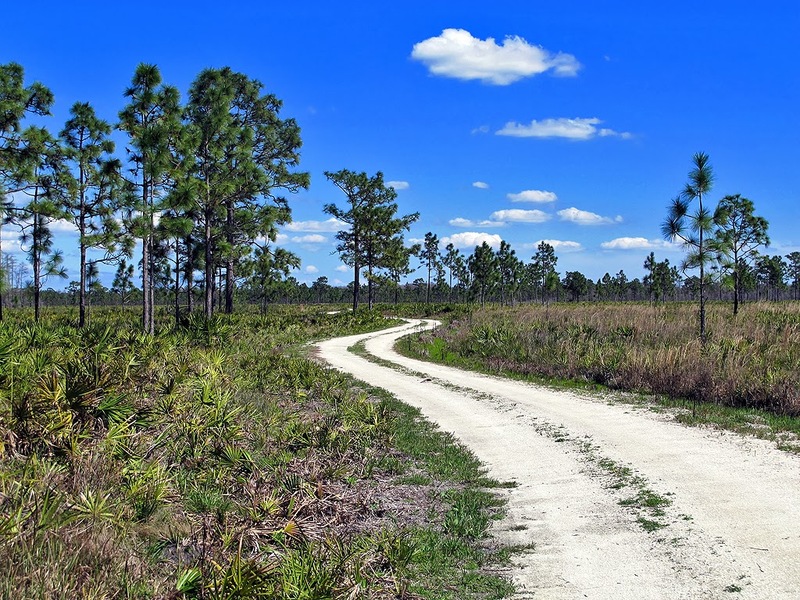 Most of all the trails blazed throughout the WMA are mainly just dirt roads. Even though you find yourself walking roads, if you look around you will see some interesting items. I enjoyed the view of Freshwater Lake (that is its name believe it or not). The pine trees are impressive to view in their own right. Several oak trees are draped with Spanish moss giving them a majestic appearance. I pretty much had the whole place to myself the day I visited in February 2013. In order to get to this trailhead you must follow a dirt road off RT46. Watch for the small sign which marks the entrance. Drive up as far as you can go, and you will hit a gate and a parking area. You will notice some structures relating to hunting. If you see hunting activity going on, I would consider going to one of the other areas located around RT46 (down Hatbill Road there are a few areas). As you head out from the gate you will notice a blazed yellow trail on the left. 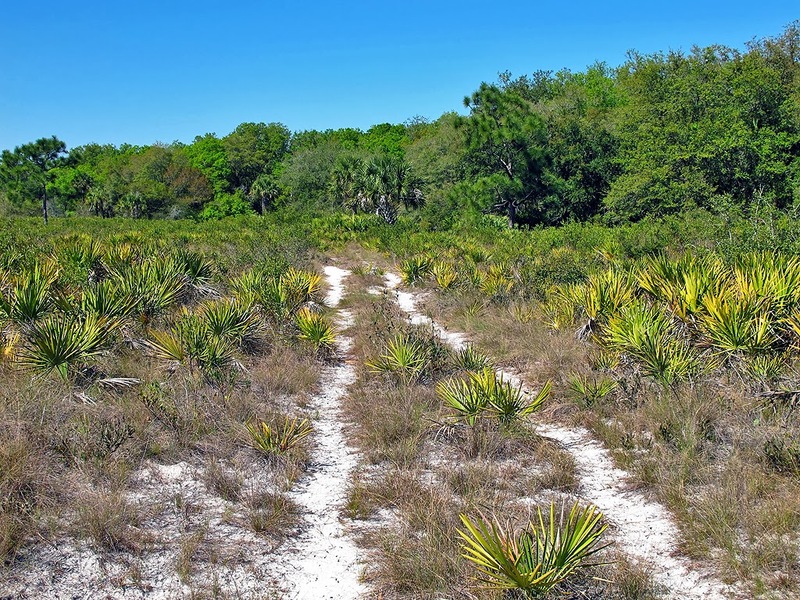 This short loop will take you through a scrub area of the WMA. I didn’t do it, so I cannot comment about it. There are other websites which will provide information about that trail. I took the main road/trail north (blazed white), passing an osprey on its nest way above on its own pole. This section of the trail takes you up under some huge powerlines. At a fork I went right and hiked further north and then west. Here you will come across a very nice primitive campsite named “Old Timers Campsite”. It has picnic tables and all. Some deer did visit me while I rested at the campsite. There is another trail nearby listed on the Topo map as “Buck Lake Conservation Area Trails”. I headed further west along the road and then cut south, exploring some more roads and then looping back to the parking area. I came across Freshwater Lake, proving some nice lake views from different spots. I felt it strange that I didn’t see any gators or wading birds, but it might have been because of the time of the day. On my way back to the parking area, I did stop a few times to take in a few things along the trail. All in all, it was 11.4 miles of hiking that day. This entrance is located off RT46, just a small parking area right off the road. From this entrance you can access Buck Lake itself. Just follow the dirt road until you see a blaze and sign which will point you to the observation tower overlooking Buck Lake. 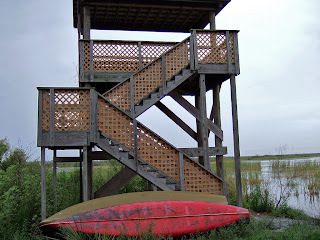 Once at the observation tower you will have a view of the lower section of Buck Lake. You should be able to see some wildlife if you are there early or late in the day. The trail is somewhat shaded in sections. The dirt road out of the parking area does lead through the heart of the WMA, connecting to the East Trailhead if you so desire. It is a long haul; a bike might make it easier. If you just want a short hike, consider just going up to the observation tower and back for a round trip of 2.9 miles. Buck Lake WMA is huge, and very open. Being that most of the blazed trails are dirt roads, you might want to consider using a bike to see everything in one day. 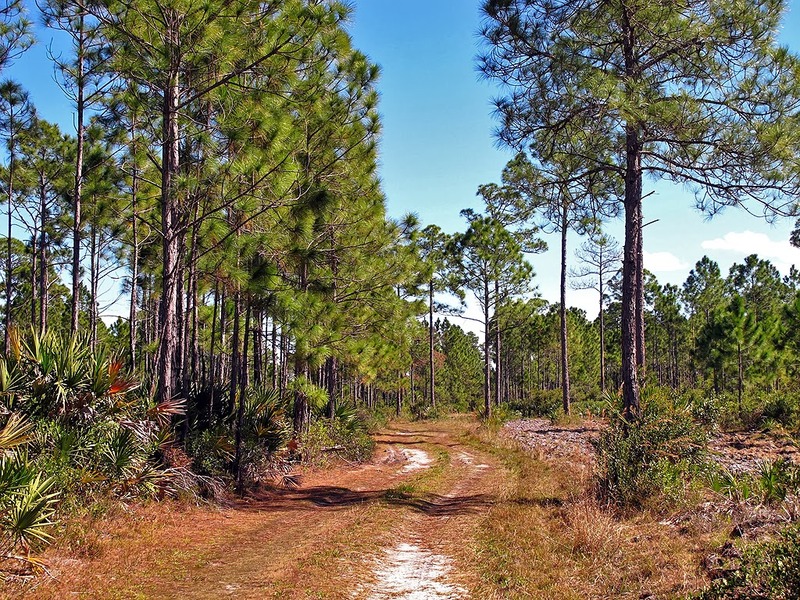 Being a WMA area, look at my hunting schedule or the FWC hunting brochure to learn when it is safe for hiking and exploring or whether you need to stay away. If you like to explore, there are plenty of places you can venture into off of the trails. Like always, make sure your GPS has good batteries. I know there is a lot of wildlife out there, just finding it can be a challenge. I enjoyed my visits to the area, but I doubt that I would do too many hikes there. The problem with most sections of Buck Lake WMA is that it is they are out in the open. Make sure you wear a good hat, take plenty of liquids and put on plenty of sun screen. This area of about 470 acres is a great place to spend a little time. Mills Creek crosses through it, thus making this woodland aptly named. 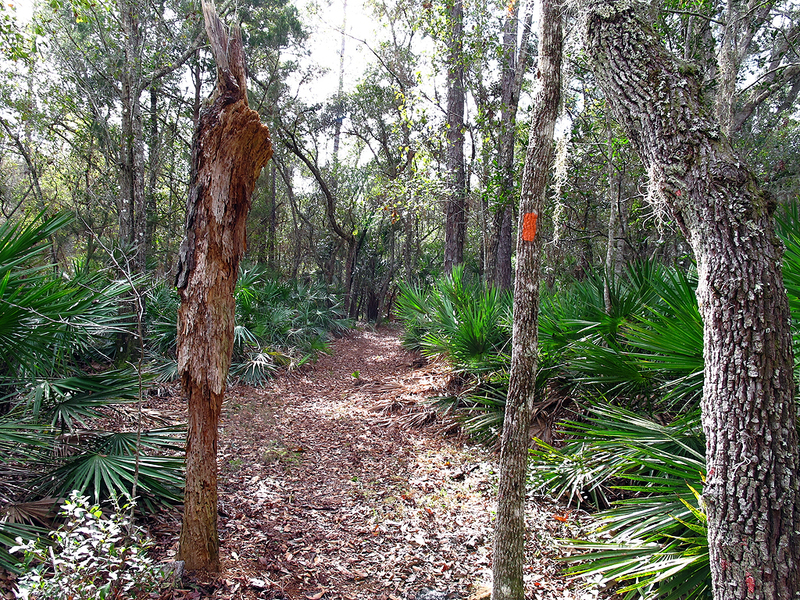 Its main claim to fame is that a section of the orange blazed Florida Trail system passes right through it. This is just one of the great aspects of this little gem. 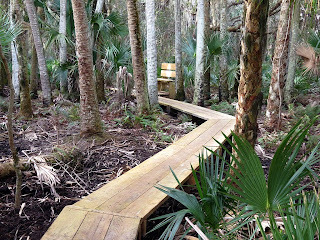 Not only is the trail very well maintained by the Central Florida FTA group, but there are many other areas to wander around in and explore. You have many options for accessing the woodland, although none of them allow an actual loop. Regardless of how you enter the area, you will have to double back to your parking spot. Some people use two vehicles, parking one at each end of the Woodland. The “Locals” are very possessive and paranoid, so make sure if you venture off the trail that you do not enter any private property. This is a conservation area, so no hunting is allowed. The day I visited the area I only saw a limited amount of wildlife, but I am told if your quiet and in the area at the right time you can see deer, turkeys, songbirds and other wildlife. The day I visited the woodlands, it was pretty dry. I can imagine during the wet season you might encounter some water. From what I can tell from the signage, this is USDA Forest Service Land. 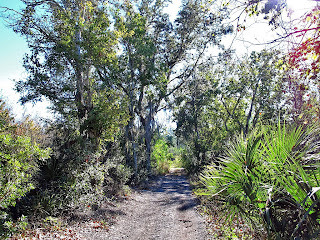 They have opened it up for the Florida Trail to pass through it, so enjoy the trail and surrounding areas. There is no biking allowed in this area, so leave the bike at home! 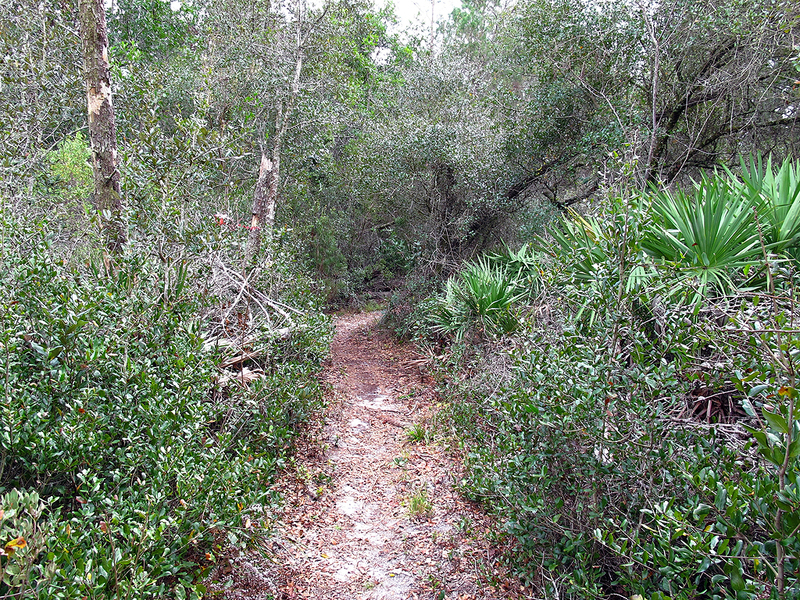 A small section of the Florida Trail winds through the Mills Creek Woodland. 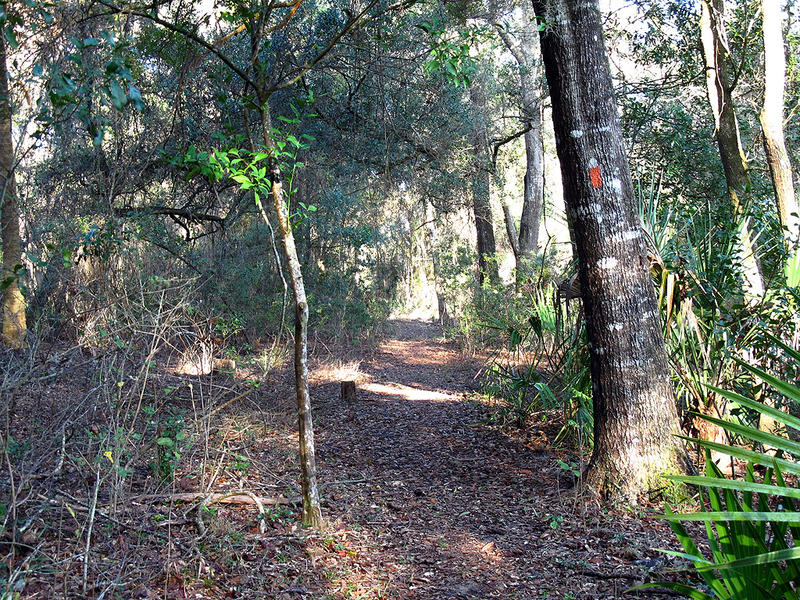 The orange blazed trail is about 3 miles long here – it actually runs from one side of the woodland to the other. 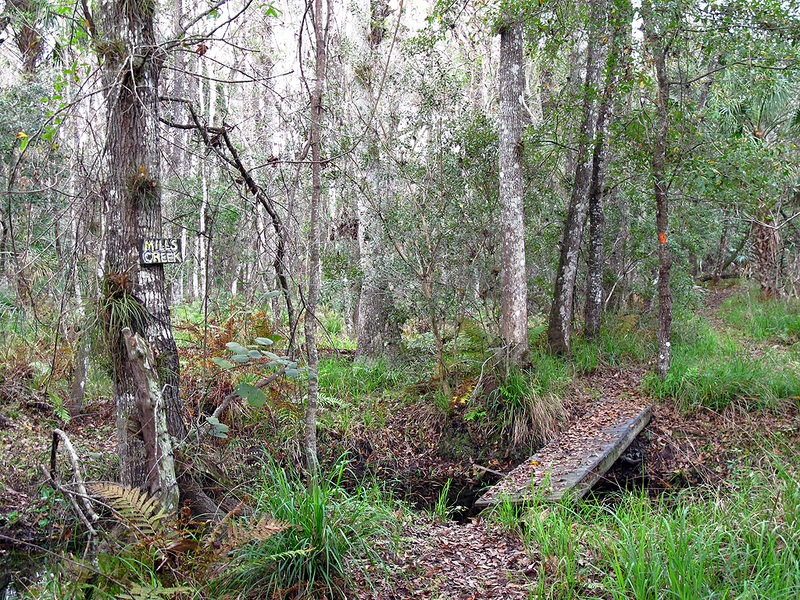 The wonderful thing about it is that you will pass through a number of Florida eco-systems as you walk the trail from one end to the other. From dry sandy sections, to wetlands, to hills and through palmetto “ponds”. You will cross a couple of very picturesque waterways which pass through the woodlands. 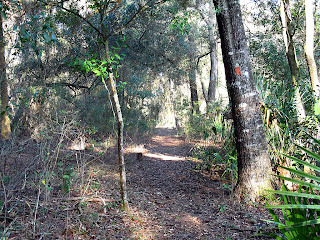 The trail itself is extremely well maintained by the Central Florida Chapter of the FTA. The local FTA have created a bridge over Mills Creek, as well as elevated sections through the marsh. They also have provided a very nice primitive campsite. 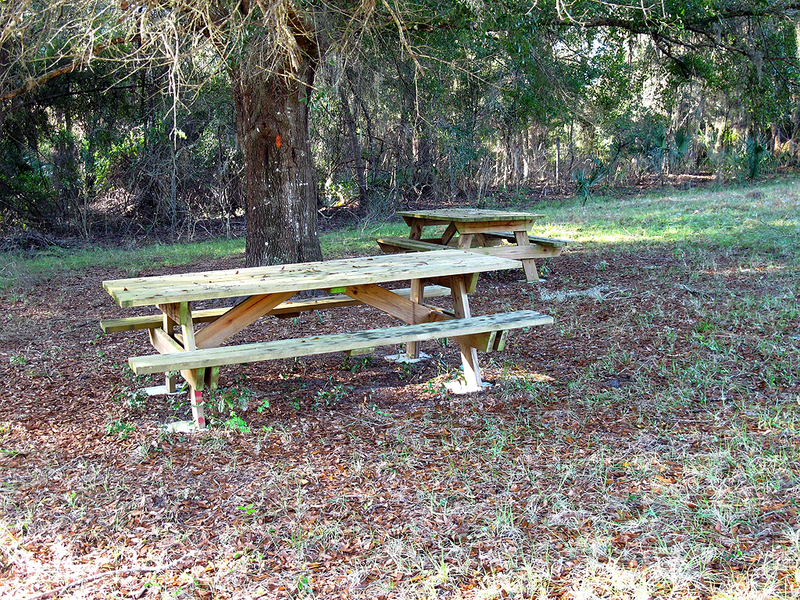 There is a small picnic area under a large oak in an open field. What I did I parked at an area provided by the FTA on Lake Mills Road. 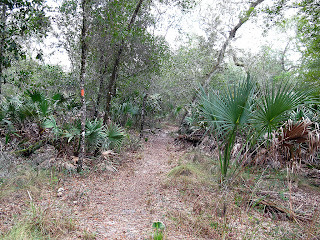 I found a well marked blue blazed trail to follow through a pasture to the orange blazed Florida Trail. When I hit the orange trail I went left towards Brumley Road. This section of the trail takes you to the main picnic area and then through some low wetlands. 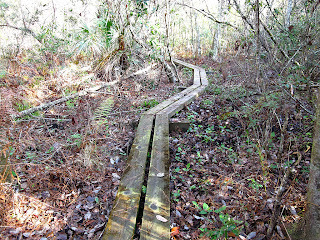 The FTA provided a couple of wooden boardwalks over the real wet areas. From there you start an actual climb up a small hill, eventually coming out on Brumley Road. If want to continue on the orange blazed trail, you will have to cross the road. There is a small section where you could park if you so desired. I elected to turn around and head back at that point. I returned to the blue blazed trail I entered on, and continued passed it. 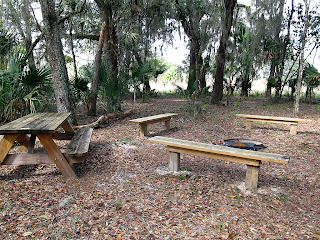 In the next section I encountered the primitive campsite, an area with a picnic table and sleeping area memorializing Wiley Dykes Sr. You will find this area just off the main trail, with a blue blazed leading to it. 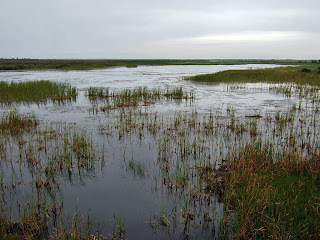 I continued on to the Mills Creek area, where I encountered true wetlands. There are bridges provided to make crossing both Mills Creek and Silcox Branch easy. From there you go up a bit and hit a sandy scrub area. The trail winds through this scrub area for far distance, giving you another view of Florida. You will eventually come to Whispering Forest Trail road. You can park here if you so desire. 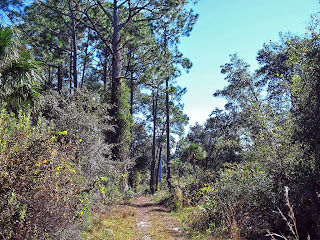 I then turned around, headed back to the blue blazed trail I came in on and exited back to my car. The total distance was a little over 8 miles. I did find a number of nicely hid GEOCaches along the trail. The Mills Creek Wetlands is a very nice place to spend some time. The trails and off-roads are very comfortable to walk. There are a number of eco-systems to observe. The variety of wildlife and wildflowers you will encounter depends on what season you visit. You can even do some GEOCaching if you so desire. Make a day trip out of it, bring your lunch and spend some time at one of the two picnic areas provided. 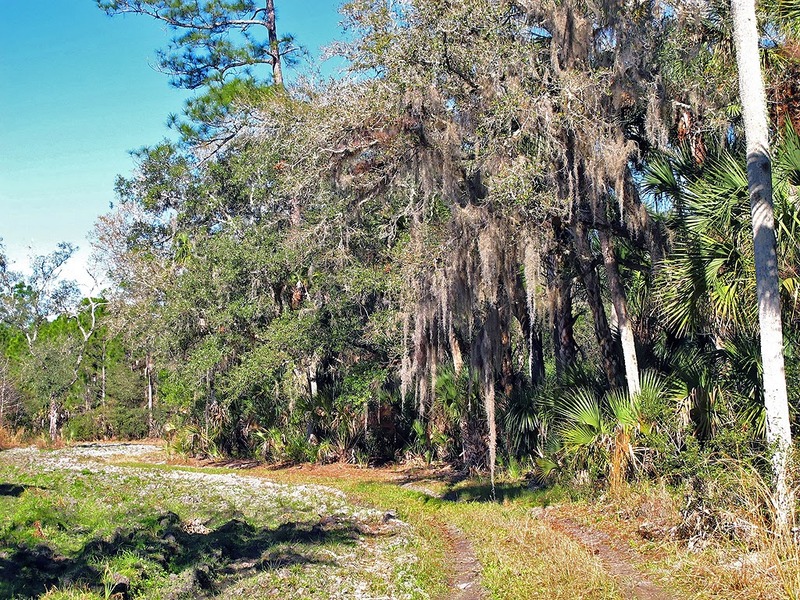 The Pine Island Conservation Area is made up of 950 acres of a variety of Eco-Systems. The area is controlled by both the EEL and SJRWMD groups. 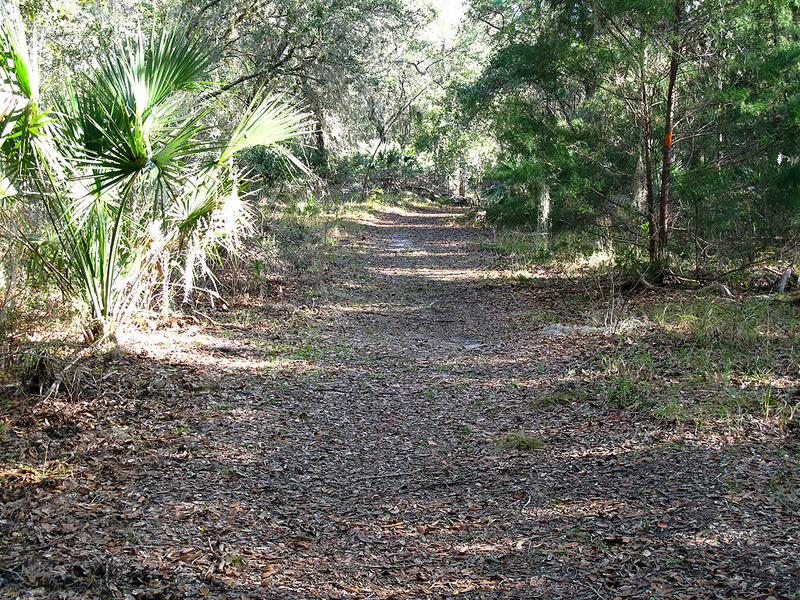 There are a number of old roads and trails which can be hiked and biked. 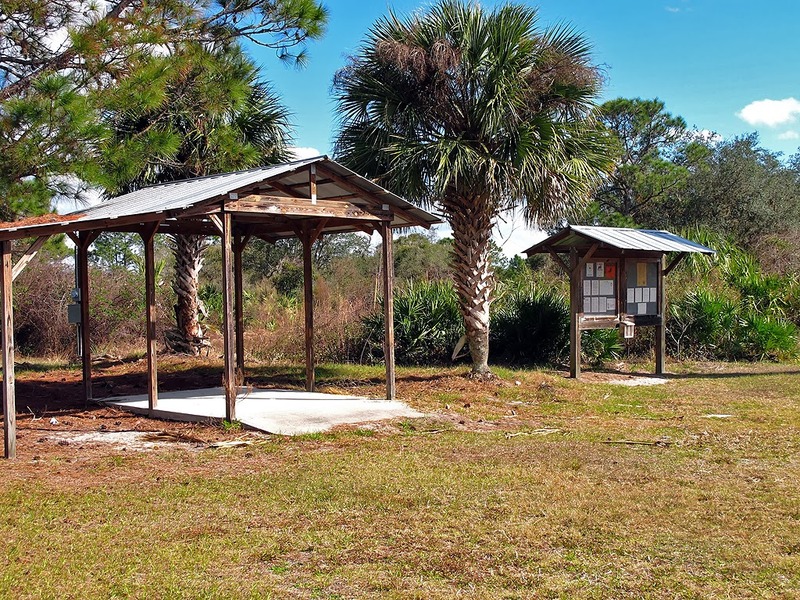 There are no fees for using any of the Pine Island Conservation area. The area did contain old homesteads once upon a time; the old roads are remnants of the previous inhabitants. You will also encounter canals and water areas which were created by the early homesteaders. I have been on just about all the trails which are marked in some fashion or are recognized as just old roads. The area is basically divided into three sections, with the main two sections divided by the Pine Island Canal which leads to the Indian River. There is only one foot bridge over the canal between the main parking area and the Indian River. You can drive over the Pine Island Canal at the main entrance. 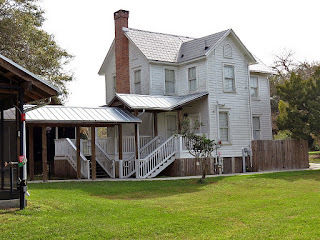 I designated the three sections as, the section north of the Pine Island canal, the section south of the Pine Island canal and the area around the historical Sams House. There are three designated parking areas which allow you to access to all three sections. 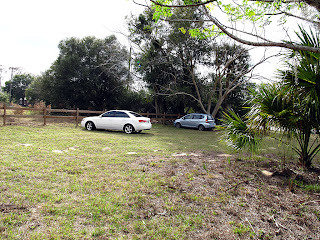 The parking areas are pretty close to each other, so parking in any of the three spots will allow access to the complete conservation area and even the Sams House nature trails. GPS coordinates for the parking areas are listed at the end of this review. 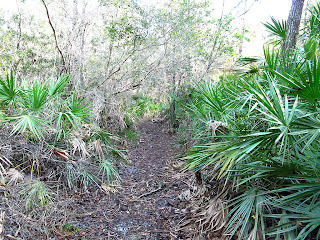 The best access to the Sams House Nature Trails is from the Sams House Historical Site located off N Tropical Trail. Hours are limited, so check ahead before you visit. 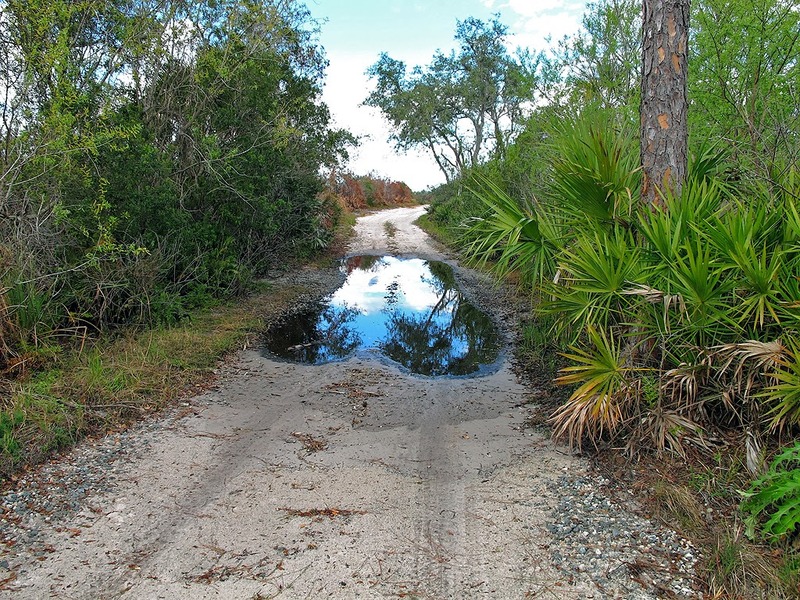 If the area is closed, than you must access the trails from the Pine Island Conservation Area. This is the area north of the Pine Island Canal which cuts through the conservation area. This area contains a number of old roads and trails. When I visited the area, only a few of the roads/trails were actually marked in any fashion. The land managers have cleared much of the land near the waterway which is just above the main parking area. 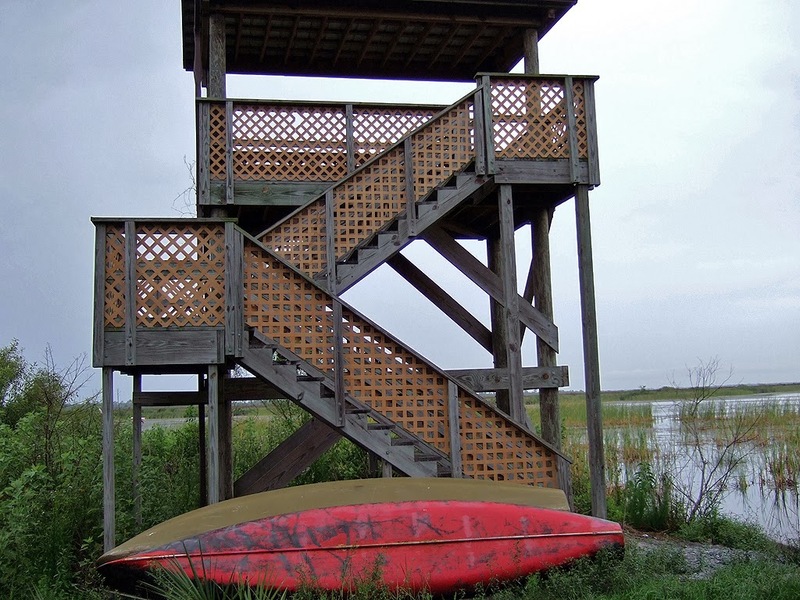 You can park and launch a non-motorized boat, kayak or canoe from a place they have provided. I headed north from the parking spot, then out a road/trail to the Indian River. The day I was there, there were some boy scouts camping out at an area provided for that purpose up near the river. I then took another road/trail south down to the powerlines and the main canal. The road/trail wasn’t blazed, but it was an old road and easy to follow. I got some nice pictures along that road/trail. You should also notice some old telephone poles along the way, some more remnants of the original homesteaders. Once you get down to the canal, you have to follow the trail/road along it until you hit the only bridge over it. 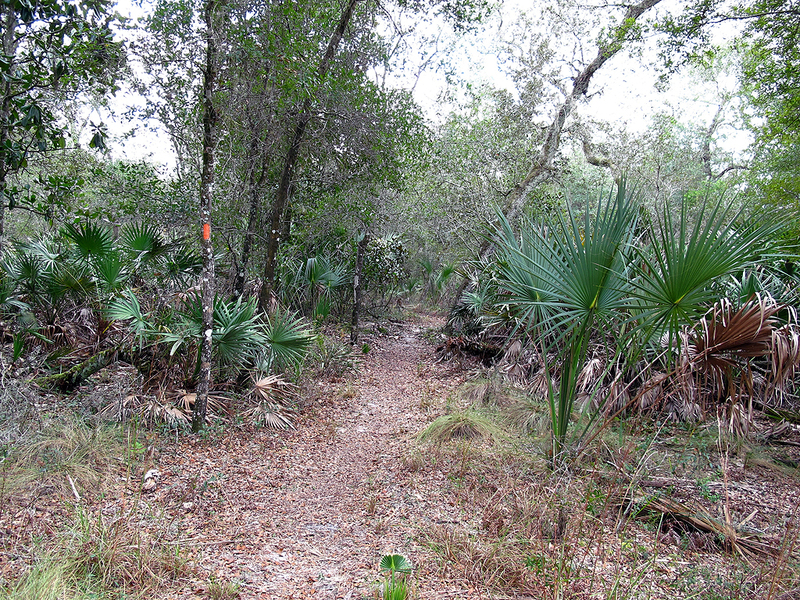 At that point you can take a short, newer trail created by the Sierra Club over to the Indian River. The Sierra Club has provided benches for you to take a break on. 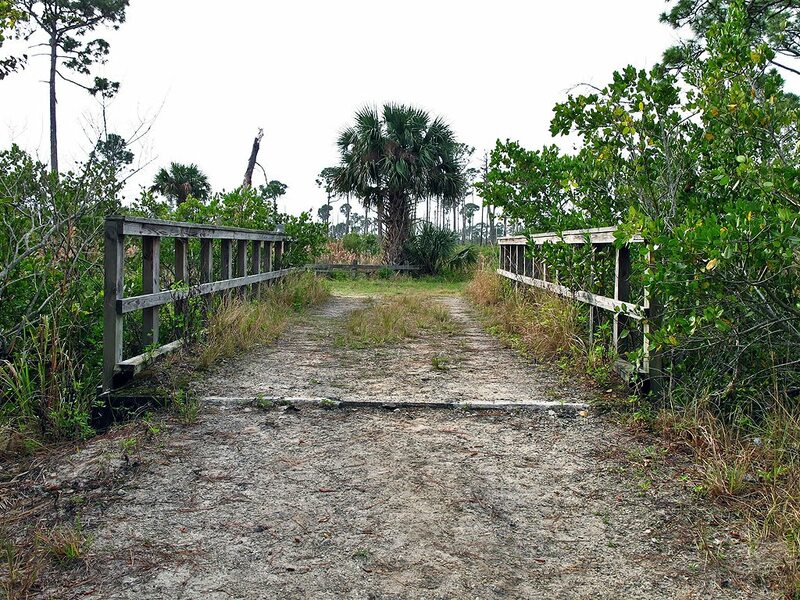 The trail from the bridge north is a loop which will take you up to an old observation platform, where you can get a look out over one of the bodies of water found in the Conservation Area. As you go up the trail you should keep your eyes open for a huge Bald Eagle’s nest which is right near the trail. You will also see some old and new trail markers, as well as old information stands along the trail. I hope that this and the other trails are on the agenda of the EEL group to restore, as they are very nice. 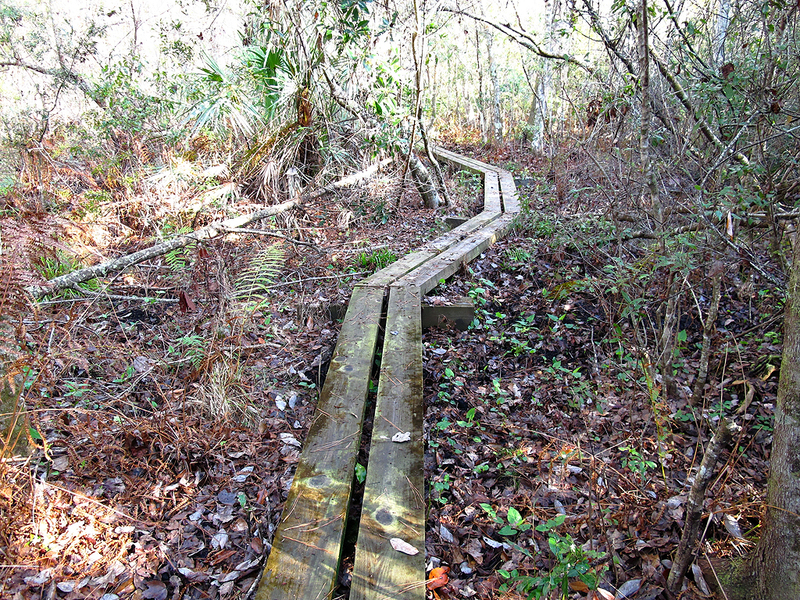 There are no boardwalks on any of the older trails, so you might encounter some mud and water at times. Once you are done with the loop, I suggest you cross the bridge over the canal and head back to the parking area using the road/trail next to the canal. Total distance is a little less than 6 miles. The section below the Pine Island Canal is what I call the “southern” section. 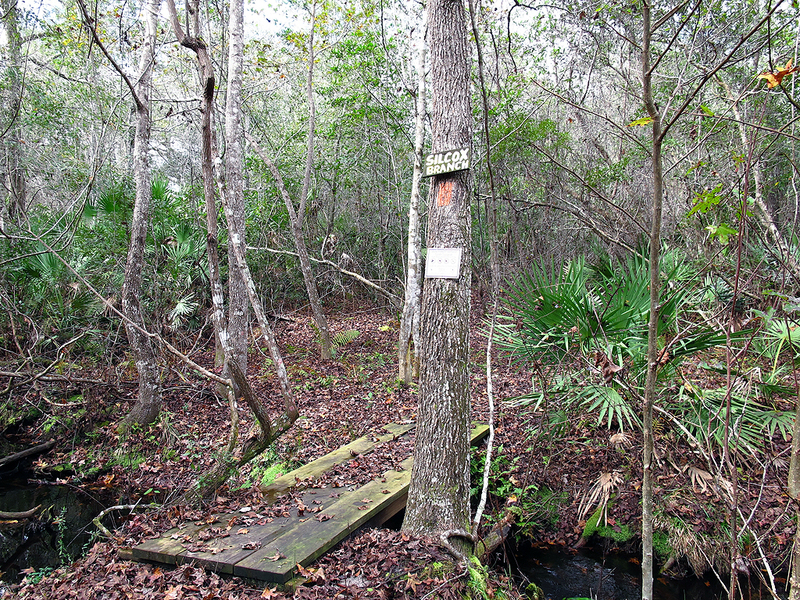 This area has a few marked trails and many accesses to a large body of water and also Sams/Rinker Canal. You can launch a non-motorized boat into the large inland body of water. 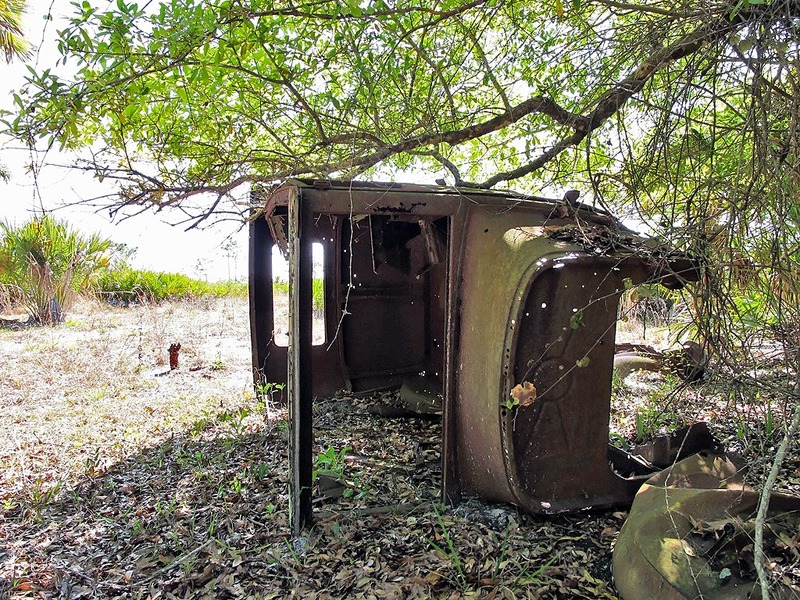 You could also drag a boat over to Sams/Rinker Canal and launch it there to have access to the Indian River. I did see some fisherman in the area of the canal, but they didn’t appear to have much action going on.. The activity around both water areas is certainly much heavier on weekends than during the week. There are some short trails and roads which you can venture on around the water areas. The nicer hike is to take the road/trail from the main parking area out along the Pine Island canal to the Indian River and then head south; following what seems to be a game trail through the grass. You can only go so far south and then you have to loop back east. You will come to a junction, take the trail south for as far as you can go – eventually you will hit a wetlands area, which can be quite muddy at times. As far as I can figure out, that is as far as you are allowed to go. Head back north and at the junction go due north and shortly you will come back to the road/trail next to the Pine Island Canal. If you haven’t hiked any of the northern section yet, take this opportunity to cross the bridge and venture into that area. 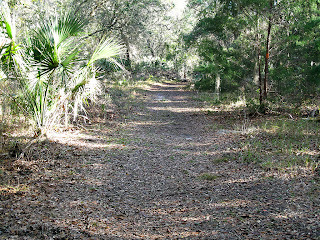 Eventually, you will have to come back to the road/trail next to the Pine Island canal because that is the only way back to the parking area. 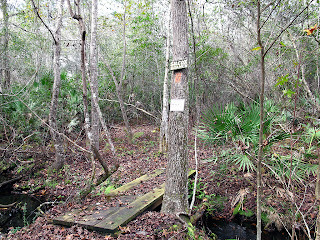 As you venture through the trails I’ve mentioned you will see old trail markers, as well as old local information stations. Hopefully, the EEL people will get the resources someday to refresh the markers along these nice trails. If you look hard enough you will also see some remnants from the original homesteaders. One thing that did stick out where some wide wooden bridges used to cross some canals. Like all of Florida history, much of it has been bulldozed under, but sometimes you are fortunate enough to spot a few historical items. The EEL Group have invested a great deal of time and money in developing well blazed trails which they have associated with their main attraction “Sams House”. The trails are best accessed from the Sams House tourist site off North Tropical Trail. The only problem with that access point is that it has limited access hours, when this was written, Thursday through Sunday. You can always access the trails from the Pine Island Conservation Area. The garnet blazed trail can be picked up just south of the large body of water below the boating parking area. To get to the trailhead, head south on what appears to be an old dirt road next to the pond. Just look for an opening on a small mound and follow the trail south. You will notice the trail marker poles that the EEL people elected to use. The trail winds South through some very picturesque areas. You will see salt marshes, Spanish moss covered trees, major palmettos, manmade canals and many other Florida related items and scenes. I did see a very large gator in one of the marshes. The EEL people have constructed boardwalks over most of the very wet areas. 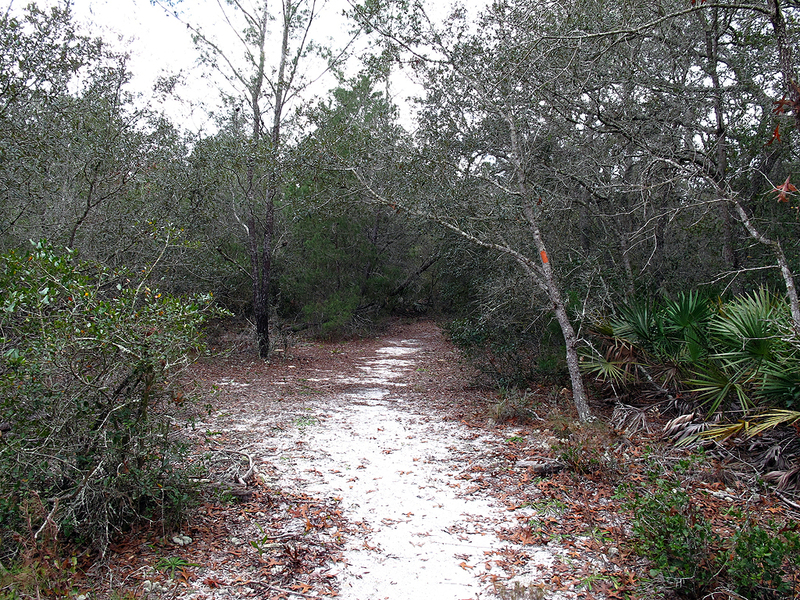 The garnet blazed trail eventually meets the white blazed loop trail. I suggest going to the right until you hit the blue blazed trail. Take that out to a scenic overlook of the Indian River. You have to backtrack along the blue blazed trail until you hit the white blazed trail again. Take the white blazed trail to the actual Sams House tourist area. If Sams House is open, I recommend a walk around the attractions provide in that area. You will be glad you took the time to do so. There is a short red blazed trail off the concrete walkway which will take to a spot where you can observe an active Bald Eagles nest. The day I was there one of the beautiful parents was sitting on a branch near the nest. Next, continue back on the white blazed trail, bearing to the right until you hit the garnet blazed trail. 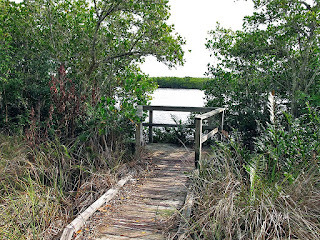 This will lead you back up North to the Pine Island Conservation Area. Based on my explorations in early 2013, these were the trails that you certainly should venture onto. 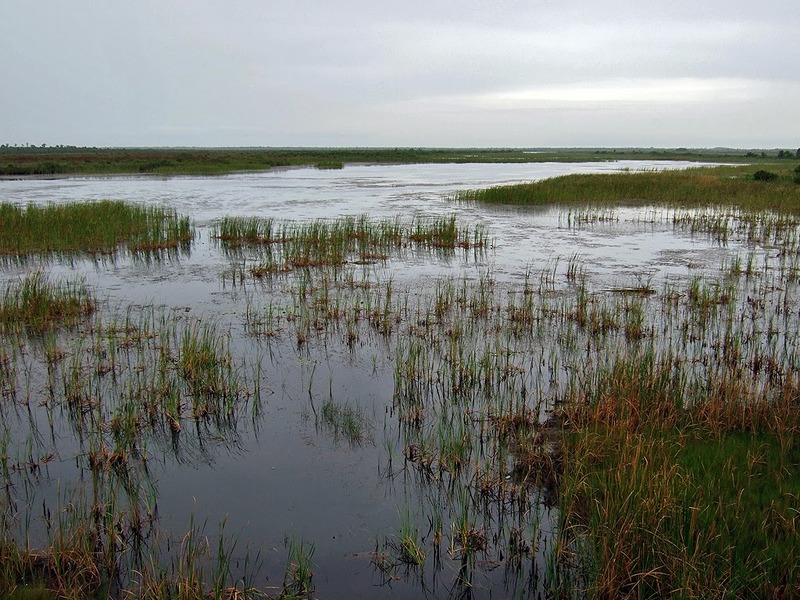 The Pine Island Conservation area is made up of many salt marshes, so always be aware of the main problem and that is salt marsh mosquitoes! Salt marsh mosquitoes are the worst mosquitoes you can encounter as far as I am concerned! If it is warm, you will encounter bugs, so be prepared. Also, most of the trails are in the open, so wear sunscreen to protect you at all times. I didn’t see much wildlife during my visit, but I really went for the hike and stayed mostly on the trails, so the animals may have avoided me. 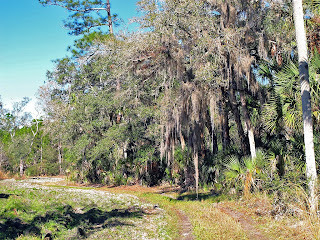 I did see one huge gator down along the garnet blazed trail of the Sams House nature trails. I had visited the area back in January 2005. I had photographed a large variety of wildflowers during that visit. I encountered a very limited variety of wildflowers during my visit in January 2013. I have encountered this problem all over central Florida, for some reason the wildflowers seem to be disappearing. Bicycling and horseback riding is allowed, but only on the roadways – stay off the trails! I did all the trails in two visits, first time I did the northern section and then a few days later the southern section and the Sams House Nature Trails. There certainly was a lot more activity going on during my weekend visit. During my weekday visit I had much of the area to myself. 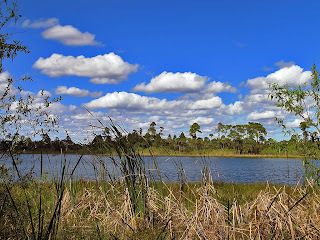 The Pine Island Conservation area is a very nice place to spend some time. The trails and old roads are very comfortable to walk. There are numerous places where you can get views of the Indian River. I wish I could say that the fishing was great, but I do not believe that to be the case. From some locations you can see manatees. The variety of wildlife and wildflowers you will encounter depends on what season you visit.